“Ghost Netting” is just translucent “rubber” (urethane?) netting. Trout colors really “pop” when photographed in this type of netting. 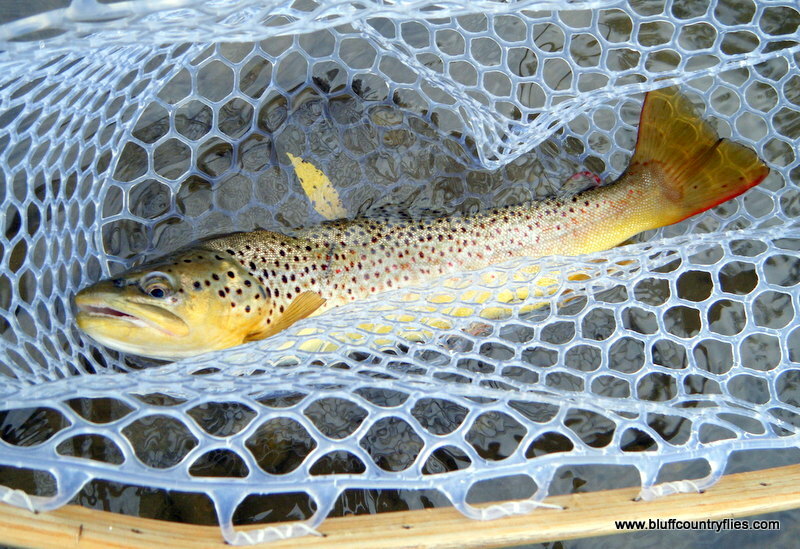 I can’t remember exactly when it was I first saw a picture of a trout being held in a “Ghost Net”…probably a couple years ago…but I do remember thinking, “wow, that net is cool. It really makes the colors in that trout pop”. Soon I started seeing more and more great “in the net” trout pictures that actually looked really good thanks to the clear rubber ghost netting. -Pics taken of trout in the ghost net can actually look really good. The whitish, blueish, clearish, translucent netting really brings out the color in the trout. 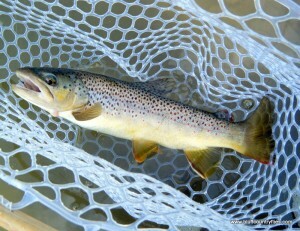 Pics of trout taken in the standard black mesh netting never really can look good. 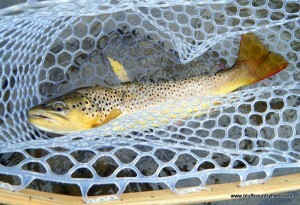 -You can’t get your hook caught in a rubber net like you can in a fabric mesh net. I had several “hook holes” in my old bag from forcefully removing stuck hooks. “Cockle burrs” and other “sticky” plant seeds can’t get stuck in the rubber bag, either. 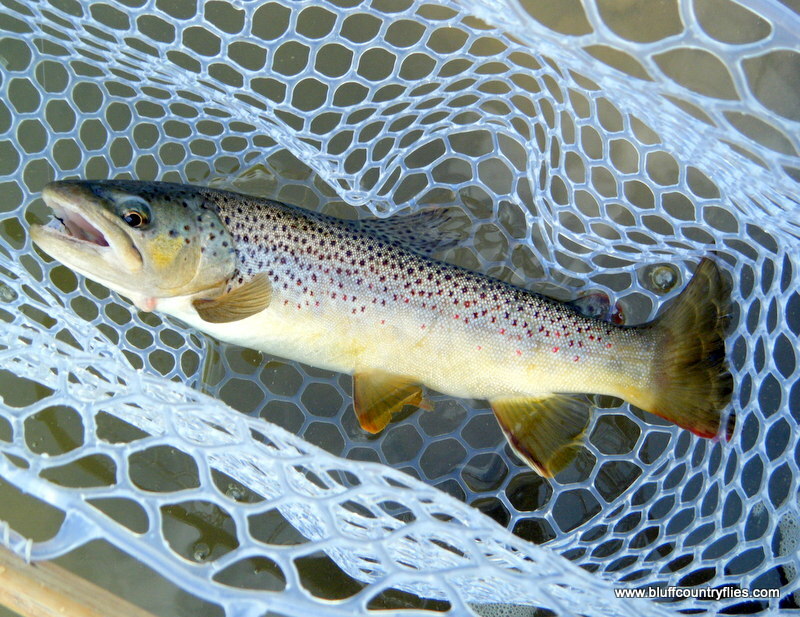 14 inch trout behave well in a rubber trout net, but what about a 20 incher? -Rubber is easy on the fish’s slime coat…but so is soft mesh…so this one is a wash.
-The ghost netting is a fair bit heavier than mesh. Of course this isn’t going to keep you from using it, but it is noticeable. -It doesn’t lay nicely on the back. The rubber is too stiff to lay down properly, and so its common for the net to swing around when you bend down…more-so than a standard net does. With my longish Oxbow net, my fly line seems to get caught on the handle more often now when wading deeper, because the handle sticks out at a greater angle from my back. -Fish seem to be able to flip out of the net a little easier, particularly larger fish. The biggest fish I’ve netted with the ghost netting has been around 15 or 16 inches and so far this hasn’t been too much of an issue, but I get the feeling a 20 inch trout would give me some trouble. In the past, the Oxbow net with standard mesh handled 20 inch trout with ease. 12 to 14 inch fish are no problem, though. I don’t regret putting the ghost netting on my Oxbow, but if I had to do it again, I’m not sure I would. It certainly has its pros and cons. This entry was posted in Uncategorized on August 11, 2014 by Brian Stewart.